Forza Horizon 4 is now available worldwide on Xbox One and Windows 10 PC, as well as the Xbox Game Pass subscription service, and to mark the release of the new open-world racing game set in beautiful, historic Britain, the folks over at Microsoft unleashed Gymkhana star Ken Block and his beastly ‘Hoonicorn V2’ on the tranquil grounds of the Goodwood Estate in Chichester, West Sussex. 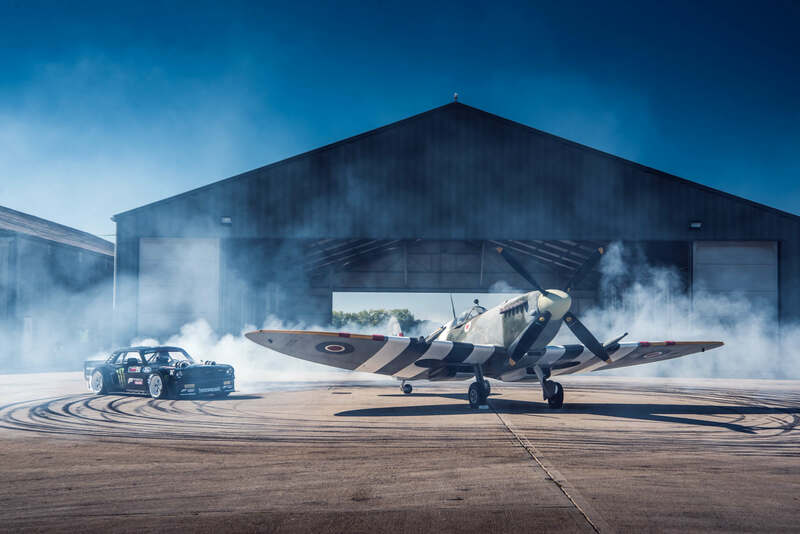 To celebrate the launch of Forza Horizon 4, the historic Goodwood Estate was transformed into a Horizon Festival of its own, featuring a series of unique experiences inspired by the game. These included Country Lane Driving through the Goodwood Estate in both a Land Rover Defender and a McLaren supercar, as well as a ‘Four Seasons Rally’ delivered through a bespoke track themed after the different environments and seasonal conditions in Forza Horizon 4. Be on the lookout for our first-hand experience of all this and more in our upcoming Goodwood experience content. 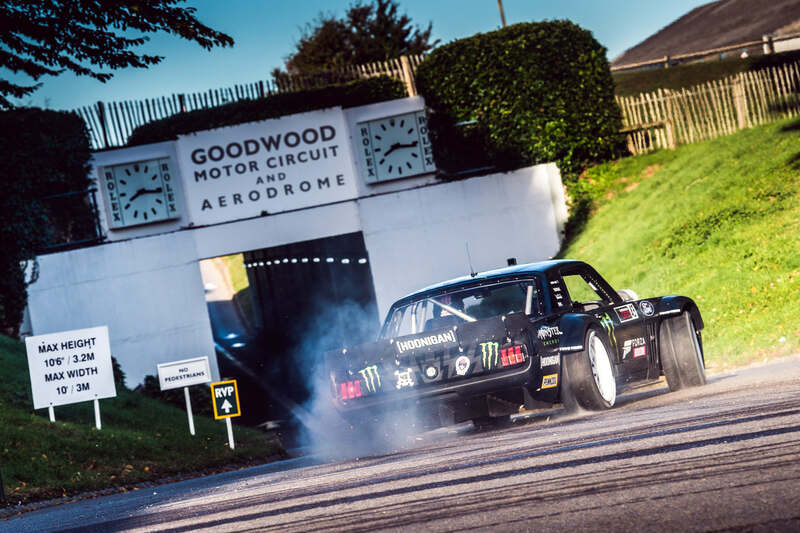 As for Ken Block, well he took the opportunity to unleash his 1965 Ford Mustang Hoonicorn V2 on the perfectly manicured grounds of the Goodwood Estate, the world-famous spiritual home of car culture in Great Britain. The result? Drifting through the Estate’s pristine entrance in a screech of tires to terrorizing three classic British Minis and donutting around a WWII Spitfire. It’s fair to say that nowhere was safe when Block was unleashed for his high-octane countryside spin. You could even hear him from the other side of the Estate! 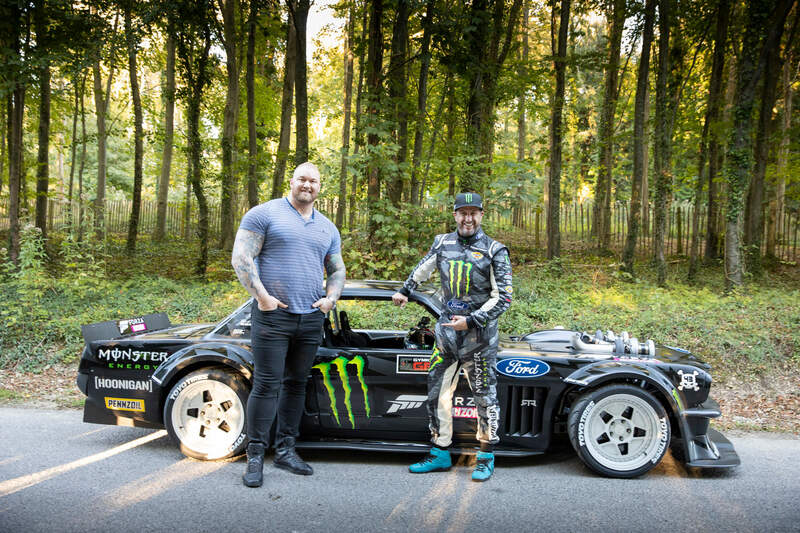 Block also tried to take Hafþór Björnsson – the World’s Strongest Man titleholder and the actor who plays The Mountain in Game of Thrones – for a spin, but amusingly the 6-feet 9-inch man couldn’t fit into the car. I suppose it shouldn’t be too much of a surprise really when you consider his size! You’ll see for yourself when you check out the video above, it’s truly bonkers stuff but in the best way. 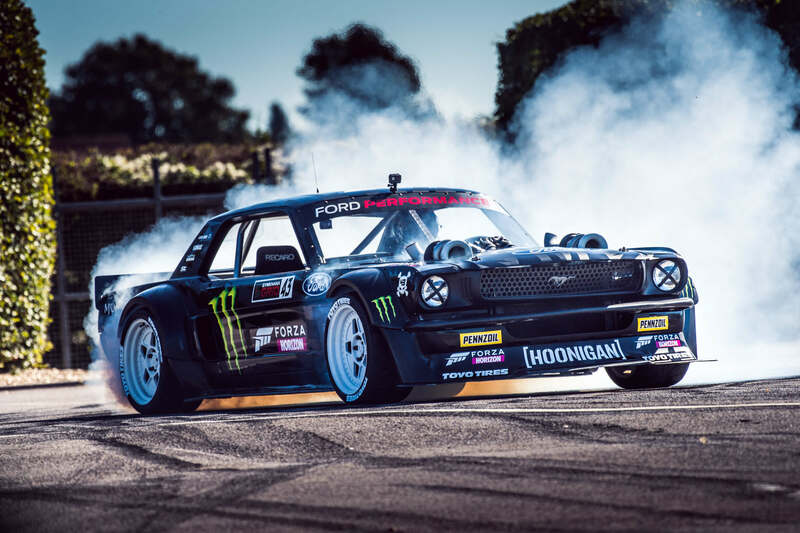 Block’s 1965 Ford Mustang Hoonicorn is one of the more than 450 cars available to collect, race and customize in Forza Horizon 4 – and it was showcased in-game with a livery created by SnakeEyes Friex, a talented designer within the Forza community. With the addition of new Drift Suspension upgrades allowing for a bespoke 60-degree angle tuning option, as well as the ability to customize your driver with new clothing and emotes, it’s never been as easy to go sideways and to do it with style. Microsoft says Forza Horizon 4 is a culmination of everything the team at Playground Games has learned over the past six years whilst developing the Forza Horizon series, and this year’s entry has some of the biggest changes to the franchise yet. Considering the overall success of the Forza franchise, and in particular, Forza Horizon 3 which has surpassed 10 million players globally, it’s no surprise that at E3 2018 last June in Los Angeles, Microsoft announced it would be acquiring the British developer based in Leamington Spa, England. Forza Horizon 4 introduces Dynamic Seasons in a shared open-world experience dubbed the Horizon Life, set in beautiful, historic Britain. Players will experience dry, wet, muddy, snowy and icy conditions as the season changes on a weekly basis for everyone, introducing new themed content, gameplay, challenges, events and rewards for all players to discover across the world simultaneously. Over the next few weeks, Playground Games will introduce new content and experiences to Forza Horizon 4, including the eagerly-awaited Route Creator on October 25th, which allows you to design and create routes for you, your friends and the wider online community. New Leagues for players to rise the ranks through in Team Adventure with unique rewards to be won will also be opened as drivers aim to reach the prestigious ‘Grandmaster’ title, should they be skilled and dedicated enough to do so. No matter where you live, the shared open-world beauty and fun of historic Britain is yours for the taking in Forza Horizon 4, and you can experience it today on Xbox One and Windows 10 PC at no additional cost should you be an Xbox Game Pass member. The monthly subscription service includes more than 100 titles, with new games added every month – including all new exclusive titles from Microsoft Studios available on the day they’re released. These include upcoming games like Crackdown 3, Halo Infinite and Gears of War 5, as well as all future entries into the Forza franchise. Those who opted for the Standard Edition of Forza Horizon 4 or acquired it via Xbox Game Pass will also be able to upgrade their copy to the Ultimate Edition by purchasing the Forza Horizon 4 Ultimate Add-Ons Bundle for $49.99/£39.99/€49.99 from the Microsoft Store. Xbox Game Pass members will receive an exclusive 10% discount on their purchase as part of their subscription. This discount also applies to individual purchases of the Forza Horizon 4 Car Pass and VIP Membership, the Best of Bond Car Pack and the upcoming post-launch expansions. The Formula Drift Car Pack for Forza Horizon 4 is included in Xbox Game Pass already and doesn’t need to be acquired separately. Should you be looking for even more Forza Horizon 4 action from the Goodwood Estate, be sure to check out the above showcase challenge featuring the incredible McLaren Senna – the cover star of Forza Horizon 4, going head-to-head against Motocross bikes. 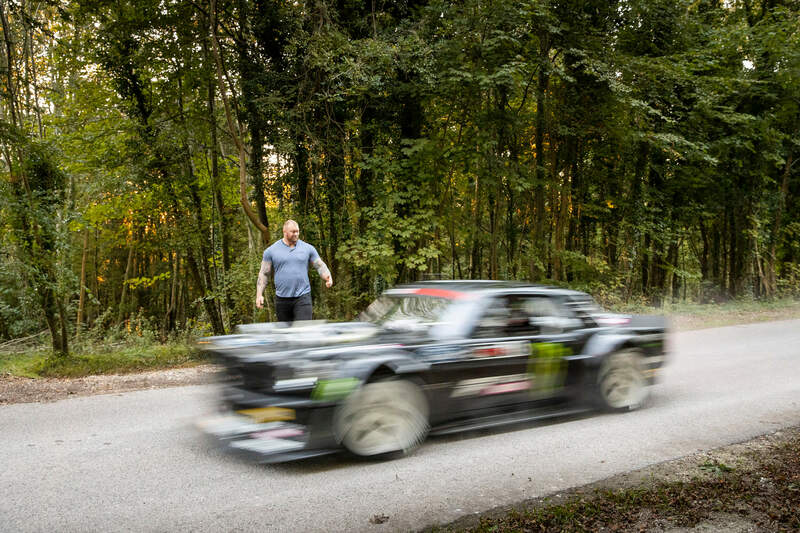 They’re fighting for the perfect car parking spot at the top of the prestigious Goodwood Estate Hill Climb. Obviously, the McLaren Senna is one of the many exotic race machines in Forza Horizon 4, and you’ll be able to take on these Motocross bikes for yourself in a dedicated in-game showcase event. For more on the Forza franchise, don’t miss the upcoming Forza Monthly livestream on Wednesday, October 3rd at 1pm Pacific (4pm Eastern, 9pm BST) on the official Forza Mixer and Twitch channels. Not only will this broadcast celebrate the release of Forza Horizon 4, but it’ll also highlight the October Update for Forza Motorsport 7, which introduces the cars of the Formula Drift Car Pack into the game, as well as a couple of new vehicles free to all players. Additionally, the livestream will relive the events of the ForzaRC Series 2 Playoffs in Mexico City from this past weekend, whilst looking ahead to the Forza Racing World Championship finals in London, England this October.